Here are the latest analyses posted by Global Research on the various consequences of the global economic crisis and what lies behind the Libor scandal. It was at the beginning of 1989 when the French academic Jacques Rupnik sat at his desk, in order to prepare a report on the state of the economic reforms in Mikhail Gorbatsov’s Soviet Union. The term that he used in describing the death rattle of the empire was “Catastroika”. In Yeltsin’s time, when Russia instituted maybe the biggest and least successful privatization experiment in the history of humanity, a group of Guardian reports assigned a different meaning to Rupnik’s term. “Catastroika” became synonym of the country’s complete destruction by market forces; the sell off of public property; and the steep deterioration of citizens’ living standards. The documentary uncovers the forthcoming results of the current sell-off of the Greek public assets, demanded in order to face the country’s enormous sovereign debt. Turning to the examples of London, Paris, Berlin, Moscow and Rome, CATASTROIKA predicts what will happen, if the model imposed in these areas is imported in a country under international financial tutelage. The criminality oozing out of every pore of JPMorgan is just the tip of the iceberg. Scandals are emerging almost daily in a global financial system that is corrupt to the bone. They are exposing as well the complicity of regulators and governments, which serve as the handmaidens of the financial mafia. I have found that it is hard to explain to continental Europe just how different the English-speaking countries are in this respect. There is a prejudice here that central bank financing of a domestic spending deficit by government is inflationary. This is nonsense, as demonstrated by recent U.S. experience: the largest money creation in American history has gone hand in hand with debt deflation. The United States has experienced the biggest political upheaval in its recent history: the transformation of a burgeoning welfare state into a rapidly expanding, highly intrusive and deeply entrenched police state, linked to the most developed technological innovations. On Friday, July 6, President Obama signed into law a bill that would renew transportation programs and extend low interest rates on student loans for one year. While this minimal gesture resulted in, no doubt, sighs of relief from those burdened by student debt, tucked away within the bill’s pages was a little-noticed proposal to further erode the funding of workers’ pensions. The bill was a brilliant sleight of hand where what it appeared to be giving with one hand distracted the public from what it was taking away with the other. At a late hour on Friday 29 June 2012, the Bundestag took two far-reaching decisions. 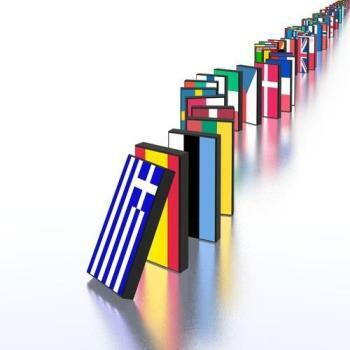 The so-called European Stability Mechanism (ESM), better known as the bailout fund, as well as the Fiscal Pact, a treaty modelled on the socially regressive German “debt brake” law and a blueprint for social service and public sector cutbacks in Europe, were up for vote. Only the Bundestag members of the Die Linke party voted unanimously against these anti-social legislative packages.